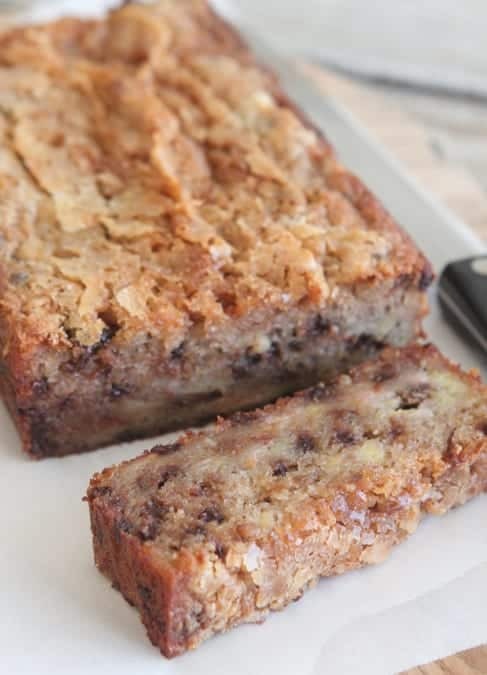 Sharing my Perfect Chocolate Chip Banana Bread today that’s going to knock your socks off! 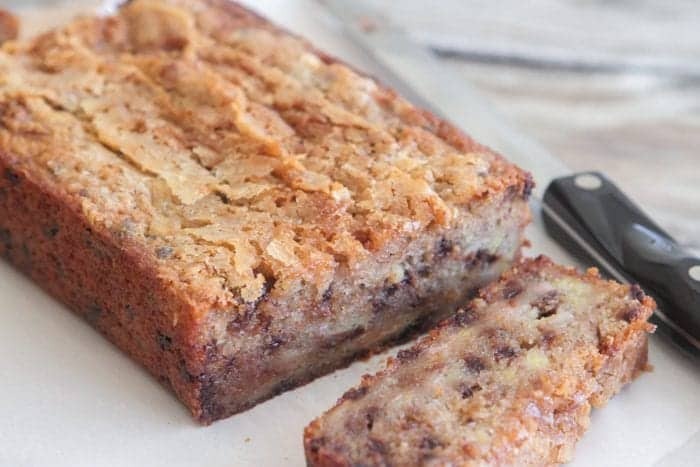 Packed with sweet bananas and chocolate chips! 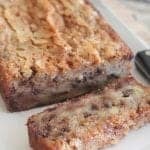 You are for such a treat with my favorite banana bread recipe! We’ve all made banana bread for years with the over-ripe bananas on the counter….but you haven’t tried THIS banana bread recipe yet. It is perfection, you’ve got to try it out for yourself!! 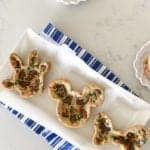 Be sure you pick up some mini chocolate chips for this recipe, makes such a difference to have the mini’s. Get ready for the BEST banana bread you’ve ever had! Enjoy! Made a step by step video for you today! Be sure to follow me on You Tube for new recipe videos this year! Preheat oven to 350 degrees F. and line a small bread pan with parchment paper or spray with cooking spray. Place butter and sugar into a large mixing bowl. Stir until well combined and add sugar, egg, vanilla, yogurt and bananas mixing well. Stir in flour, cinnamon, baking soda and salt. Mix until just combined then gently stir in chocolate chips. Transfer batter to prepared pan. Bake for 50-60 minutes, until baked through. Test with a toothpick to make sure. Remove and let cool completely before slicing. That banana bread looks so nice and moist and good! This bread does look perfect! Please give dimensions of “small size bread pan”. Thanks for the recipe! Best ever bread I have ever seen. I think thats a great one. Very disappointed. I wasted ingredients and my time making this banana bread. mushy. Did not rise; but neither did the one in the picture. I made two and tossed them both in trash after tasting a bite. trying to save others from wasting time and effort and ingredients. Sorry, I’ve been cooking for many years and this was not very good.